J. Mater. Chem. A, 4, 632-639 (2016). DOI: 10.1039/C5TA05025A. Nanoscale zero-valent iron (nZVI), with its reductive potentials and wide availability, offers degradative remediation of environmental contaminants. Rapid aggregation and deactivation hinder its application in real-life conditions. 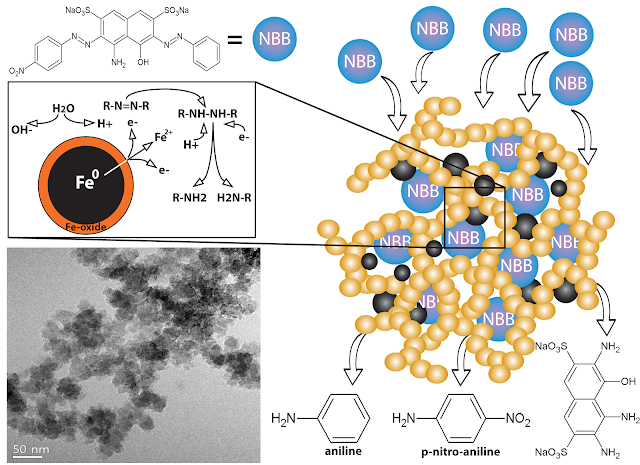 Here, we show that by caging nZVI into the micropores of porous networks, in particular Covalent Organic Polymers (COPs), we dramatically improved its stability and adsorption capacity, while still maintaining its reactivity. We probed the nZVI activity by monitoring azo bond reduction and Fenton type degradation of the naphthol blue black azo dye. We found that depending on the wettability of the host COP, the adsorption kinetics and dye degradation capacities changed. The hierarchical porous network of the COP structures enhanced the transport by temporarily holding azo dyes giving enough time and contact for the nZVI to act to break them. nZVI was also found to be more protected from the oxidative conditions since access is gated by the pore openings of COPs.